Let them shoot their own holiday classics. iPod nano. With a built-in video camera, a larger screen, and FM radio with Live Pause, iPod nano puts even more in an ultraportable package. Other ways to rock their holiday. Holiday cards they’re sure to love. A gift that speaks for itself. Something to go with that holiday popcorn tin. 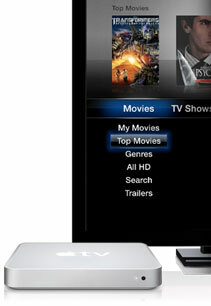 Turn their television into an entertainment center with Apple TV. They’ll enjoy HD movies and TV shows, iTunes music, photos—even Internet radio—with one simple connection. Great benefits when you shop online. Great ways to shop the Apple Retail Store. Reserve selected Apple products online today, and have them ready to pick up and purchase in any Apple Store December 15 to 24. *Free shipping for products purchased between November 30, 2009, and 10:00 a.m. PST on December 23, 2009. Terms and conditions apply. For more details, see http://store.apple.com/us/browse/campaigns/free_shipping_popup. Some applications are not available in all areas. Application availability and pricing are subject to change. Messages engraved on iPod nano, iPod classic, and iPod touch are limited to two lines, 29 characters each; on iPod shuffle, two lines, 14 characters each. Engraving and gift wrap are not available for refurbished iPod models. Prices are as of December 7, 2009, do not include taxes or shipping, are subject to change, and are listed in U.S. dollars. The mention of third-party products is for informational purposes only and represents neither an endorsement nor a warranty. Apple assumes no responsibility with regard to the selection, performance, or use of these vendors or products. iTunes Gift Card recipient must have or open an iTunes Store account in the same country as purchaser to redeem gift. The iTunes Store is available only to persons age 13 or older in the U.S. and many other countries; see www.apple.com/support/itunes/ww/ for a list of countries. Requires iTunes, compatible hardware and software, and Internet access (fees may apply). Terms apply. See www.apple.com/itunes/whats-on/ for more information. Content sold separately. Available on iTunes. Title availability is subject to change. Celebrity endorsement not implied. TM and copyright © 2009 Apple Inc. 1 Infinite Loop, MS 83-DM, Cupertino, CA 95014.